And today we will join Boudin and Pepper Jack Cheese and Panko Bread Crumbs stands in as Best Man!! 1/8 tsp cayenne pepper or spice it up! Mix the Panko bread crumbs with the seasonings, black pepper, garlic powder, onion powder and cayenne pepper. Using the store purchased boudin variety, remove the meat mixture from the casing. For easy handling chill the boudin; using scissors or the point of a knife, slit the casing across the length of the boudin. Cut the link in two or three inch sections; if you want larger boudin balls cut in larger pieces. Cut the pepper cheese block into approximately 1 inch X 3/4 inch cubes depending on the size of the size of the boudin balls. Make an indention in the boudin piece and place the cheese in the center. 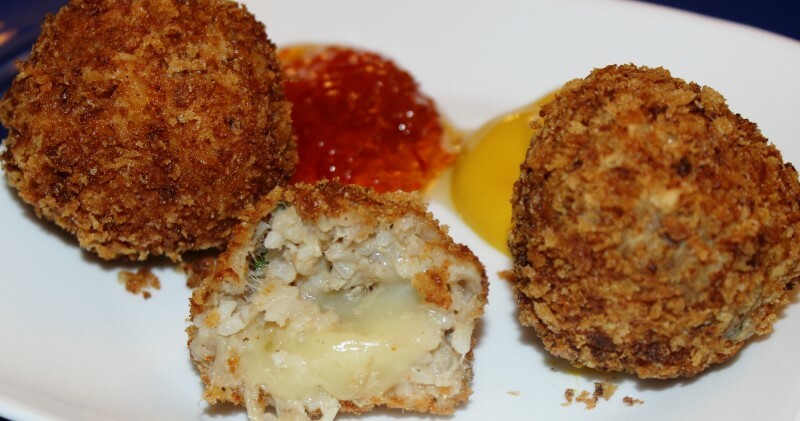 Gently mold the boudin around the cheese into a round ball. Or shape the boudin in the cup of your hand, place the cheese in center and close into ball. Whisk the milk and egg in a glass bowl. First dip the ball in water; next coat with flour, then with the milk and egg mixture, finish with the seasoned Panko. Although chilling for one hour to two hours is recommended, you can fry right away, If making ahead, chilling is great. Method 1 - Heat oil to 350 degrees Heat the cooking oil until a small amount of flour dropped in sizzles on top fry for 3 to 4 minutes or until golden brown. Place on paper towels to drain. Serve warm but will taste great even when cold. Now get me dem crackling and my pepper jelly. Method 2 - Bake the boudin balls in a preheated 375 degrees oven. Place the boudin on a cookie sheet and bake for 20 to 25 minutes until golden brown, turning halfway through the cooking process.